All I can say is *yay! * I better inform my parents about this new turn of events. Btw, have you ever eaten at Asian Noodle? Haven't tried Asian Noodle. But I heard about it at MMM-YOSO, and it sounds like my kind of place! I ate the leftovers yesterday for breakfast and lunch...still pretty darned good! Definitely one the best dishes made of beef I've ever had. No joking. This is good stuff. I'm pinay and i can't eat pinakbet becuase of the bitter aftertaste. i'd go there for the bistek. looks really good! i always enjoy your blogs! it's torture to read it when i'm trying to lose the holiday calories. YUM! I'm heading to Sushi 5 today. Happy Holidays Elmo! What an interesting post! We live literally about 5-10 minutes from Magic Wok, but I've never been there--my parents went several years ago and said they had the worst Chinese food ever there. I always see it when we go to Don Jose's though, which is in the same parking lot. We'll have to give it a try one of these days, now that we know what they serve. Thank you for spreading the info! Yum! I have my appetite back, and here you go talking about three of my favorite dishes in Filipino cuisine! Pinakbet is my absolute favorite! I am definately a fan of bitter melon! I think that bistek is reason enough to try it. But their menu is large, and covers the gamut. You can even have a traditional Filipino Breakfast there. It's served all day. Likewise! I hope you like Sushi 5. Some reports say that they don't have as many ready-made sushi rotating, but that's fine by me since I usually like to order everything I want to eat. Go there when you have some time to kill. Yes, it's confusing. 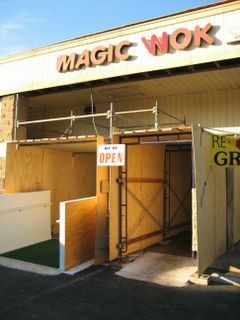 The first time I heard about Magic Wok, I said, "Isn't that the Chinese take-out chain?". But nope, although they adopted the name from the take-out place that occupied it, they serve home-style Filipino. 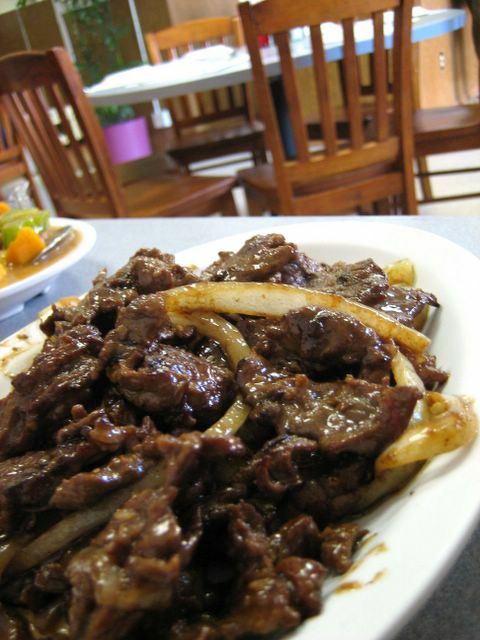 If you're new to the cuisine, that Bistek dish is a good place to start! Yummmm! Isn't pinakbet great? I tasted it for the first time at Magic Wok maybe about a year or two ago. And the stuff you get at turo-turo places just doesn't cut it for me anymore. It's gotta be fresh like they do it. Fresh, and scorching hot out of the wok. OK, we picked up from there the other night--everyone liked it! We ordered exactly what you noted in your post along with the broccoli beef (I know...I know...but my Dad likes it)--we particularly liked the tagalog and the noodles. I was told that the place was packed when they went to pick it up, so I guess it's doing well. Thanks! We would never have tried it if you hadn't mentioned it. Well that's easy, I'll let you guys choose! You tried it! Great! 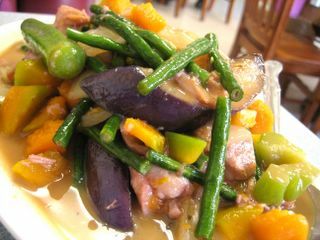 Although I notice that you didn't mention what you thought of the pinakbet. It is usually pretty foreign to the non-Filipino palate at first, like it was to mine. An acquired taste, I think is what one would call it. Also, if you did take out, did it stink up your car for days afterward? That bagoong is pretty pungent stuff. I have a similiar "re-opened" restaurant up here in Oakland, called "Fenton's." It is similar because it too was decimated by a fire set by two ex-employees, but now it is back better than ever! Delicious post and just wanted to wish you a "Happy New Year" and wish for many more posts on Monster Munching in the future! You mean Fenton's the ice cream place in Oakland?? Whoa! Two ex-employees set the place on fire!? Those are some mean Mr. Grinches! But Happy New Year to you as well! I'm looking forward to reading your blog and hopefully keeping up on my side of the fence. A fire at an ice cream parlor? Somewhere in there is irony. We liked the pinakbet too, although it did have something in it with a slightly bitter aftertaste--I think it would take a little getting used to, but the rest of it was good. Ah, that bitter taste is from the aptly named bittermelon. It's definitely an acquired taste. There's a dish that Magic Wok sells (called Ampalaya) that uses it as a main ingredient, and the first time I tasted it, I thought it tasted like soap. Then, after a while, I craved it. Strange how once our palates become used to something, it begins longing for those flavors. For example, I never liked beef tendons before. Now, it seems like I've developed an obsession for it. Actually, "ampalaya" refers to the bittermelon itself. It's cognate with Indonesian "peria" and Balinese "paya". 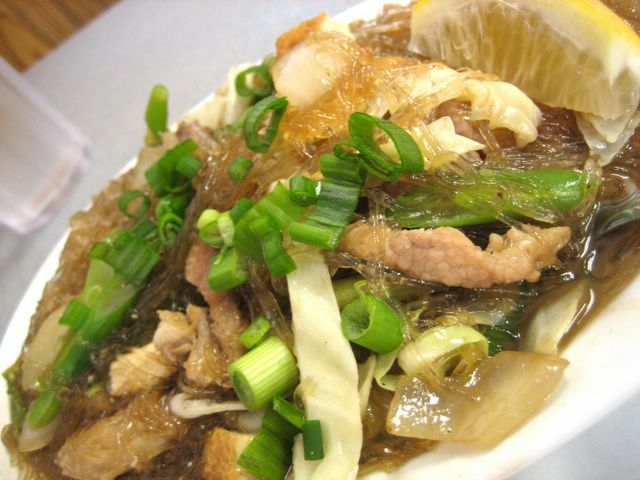 And beef tendon - mmm! how do you get such clear pictures for your digital camera? do you shoot in manual mode and play with the aperatures? I have a high end sony dsc v3 and my pictures come out drab.appreciate your help. I had no idea Indonesians ate bittermelon too. I actually just use the P setting, and also use Photoshop to readjust the levels. But you should see how many photos I throw out. For every good picture you see on my blog, there are six bad ones. I will agree, Magic Wok has the best Filipino food there is outside of the Philippines. The Bistek Tagalog is one of my favorites along with Pancit Bihon, Crispy Pata. The calamares is good too. When we have parties its usually Magic Wok catered. Its hard to get a table for Sunday Lunch. They were supposed to move to a bigger space before the fire. Dont know if its still going to push through. Have you tried their SISIG?! OH. DEAR. LORD! I've never tasted anything so great in my life. SOOOO GOOD. Great with rice, of course. Oh I havent! I should try it one of these days. The sisig in Pinoy Bistro is pretty good too but there's new resto about to open in Cerritos called Gerry's Grille and we are waiting for it because its known in the Philippines to have the best sisig. Cant wait till it opens. Wow ! I' am so glad to know this place is still open . My family and I used to go there every sunday after church and it has never failed us . The BEST filipino food in Cali for sure .The Best Crispy pata , delicious .